Note from Saqra: Lion in the Sun was a major importer for the American belly dance market in the 1970's and early 1980's. I have an original Lion in the Sun catalog. It occurred to me somebody might actually be interested in this information on the fabric "Persian Lace", so I'm going to take a moment and share. 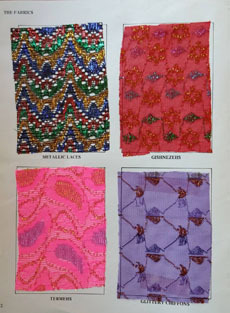 "Persian Lace" was a fabric used in belly dance costumes during the 1970's and 1980's. It consisted of a man-made background fabric with metallic decoration. Worn by villagers and nomadic tribes, [these fabrics] are truly ethnic in origin, yet appropriate for both ethnic and cabaret costuming. THE METALLIC LACES - Available in a rainbow of colors (including a family of colors we have named "Rainbow") the metallic laces are the uncontested monarchs of these lovely fabrics. Extremely lightweight and subtly sheer, these fabrics compliment all fabrics as veils, skirts, harem pants, etc. Metallic lace is available in gold, blue, silver, white silver, magenta, red, emerald green, lime green, purple, orange, raspberry, and a variety of rainbow multicolors. THE GISHNEZEHS - The Gishnezehs are knits with multi-color metallic designs woven right into the fabric. The heaviest of these lightweight fabrics, the Gishnezehs are also the most opaque. They make into exquisite skirts, harem pants and baladi dresses, etc. and are available in the following colors: black, blue, green, purple, red, magenta, yellow, and raspberry. THE TERMEHS - Are a family of fine mesh fabrics which feature a Paisley pattern in metallic gold leaf, blue, green, magenta, purple and red. The Termehs are so subtle that they are perfectly suited for daytime use, but become incredibly light-catching in the club. Well suited for skirts, harem pants, Baladi or Ghawazii costumes. Termehs are only available in black, white or pink. THE GLITTERY CHIFFONS - Our widest selection! Comes in almost any color imaginable with gold, silver, silver and gold, or multi-color metallic threads woven into the fabric. These are the most lightweight and sheer of all the Persian Lace fabrics we import. They compliment all of our other fabrics and make absolutely beautiful skirt and veil sets, harem pants and veil sets, baladi dresses and the like. A variety of metallic accents are available in background colors of red, green, blue, yellow, turquoise, magenta, purple, black, white, orange, raspberry and pink. Aaaaaaand there is your blast from the past moment. I have a TON of this stuff in both garment form and in my fabric buckets.